The Herb Gardener: Should you Use Medicinal Comfrey? Should you Use Medicinal Comfrey? Comfrey (Symphytum officinale or the Symphytum uplandica x.) has received bad press in recent years, but it can still be an herbal secret weapon. The trick is in using it with care, somewhat as you would a prescription medication. Although the entire plant has been used as a remedy since before the Middle Ages, ingesting comfrey is now considered unsafe. It contains potentially toxic pyrrolizidine alkaloids that have been linked to a number of nasty disorders, including cancer and liver damage. 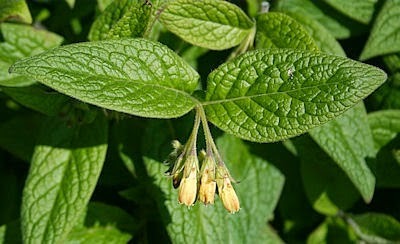 It is even considered dangerous to apply comfrey topically to open wounds, or to use it for longer than 10 days in a row, or for long periods, even with breaks in between. The recommendations vary somewhat, but the take away is to use comfrey carefully, only externally, for short periods, and even then only occasionally. Hmm, sounds scary. Before you set comfrey aside as a bad bargain, though, read on. Allantoin is the beneficial chemical present in comfrey. It's a compound associated with very effective cellular regrowth and repair. Actually, allantoin is used extensively in the cosmeceutical industry today, but that type of allantoin isn't extracted from comfrey. It's produced synthetically. At this time, it's considered okay to use comfrey leaves and leaf extracts topically on small areas of unbroken skin. Comfrey will help reduce pain, inflammation and bruising. It will also speed healing. Condition: You strained your back and have minor but very distracting and inconvenient lower back pain. Not wanting to visit the doctor to get another prescription for an anti-inflammatory, you apply a comfrey ointment or poultice to the area, replacing it every few hours. Result: The comfrey reduces the swelling which was placing pressure on your nerves, and the pain dissipates to manageable levels. This happens surprisingly quickly. Conclusions: Should you check with a doctor if you think an injury may be something more than an uncomfortable inconvenience? Definitely. Should you take care not to overtax your back (or other area of your body) until it's had a chance to heal completely? Absolutely. The option of having an herbal aid to help you manage the discomfort is pretty empowering, though -- and convenient, too. As with other herbs with a long history of use that somewhat contradicts current scientific thinking, you're likely to find differing, often passionate, points of view about using comfrey. Health food stores, Amazon.com and others still sell comfrey tea, for instance, even though taking it internally is almost universally discouraged today. It's interesting to note that Comfrey products are available in the U.S., but are now banned in Canada, Australia, Germany and a number of other countries. 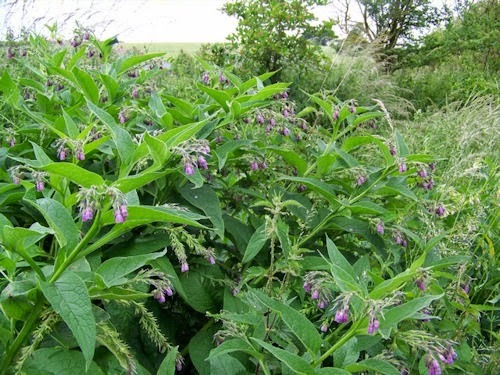 For practical purposes, use of comfrey is contraindicated if you are currently taking prescription medications (especially those which pose a risk of liver damage if abused), are pregnant, breastfeeding, are treating a young child or the elderly, or currently have liver problems. One major concern is that comfrey could team up with other meds to cause liver damage where one or the other alone would not. 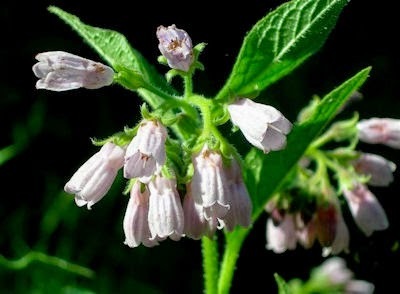 As an example, acetaminophen, the main ingredient in pain medications like Tylenol, is one common over-the-counter drug that's contraindicated when using comfrey. If you still feel using comfrey may be right for you, I recommend trying it to treat a minor strain or back pain using a very simple ointment. There are lots of ways to use comfrey externally: You can add it to lip balm, make a cream for burns and inflammation or whip together a compress. You can dry it and add it to a DIY tea bag as a mini poultice for a bunion or bee sting. For your first comfrey experiment, though, I'd recommend an ointment. It'll keep a while, and you can try a comfrey cure for a sting, burn or inflammation easily once the concoction is sitting in your fridge ready to go. Although the best comfrey ointments include other helpful ingredients (like calendula) and often have a smooth consistency, thanks to the addition of beeswax, our simple two ingredient comfrey ointment recipe uses good old petroleum jelly. I recommend it to newbies because it's stable, easy to work with and convenient. The best recipes are the ones you actually use rather than just peruse, and nothing makes an interesting recipe more doable than having the ingredients on hand. If you find you like using comfrey, you can move on to other, more ingredient dense preparations later. Consider this a test to see if comfrey lives up to the hype. This recipe uses dried comfrey. If you don't have any around, you can find it at your local health food store or online. For this one, you'll need a double boiler or small crockpot, a couple of heatproof jars, a fine mesh strainer or cheese cloth, petroleum jelly and dried comfrey. Melt petroleum jelly in a small (appetizer sized) slow cooler set on low, or use a double boiler. Continue heating the ingredients for a couple of hours. If you are using a double boiler, the water should be at or just below a simmer. Strain the hot oil through a fine mesh strainer or three layers of cheesecloth. (Take care. The oil will be hot and stick anywhere it lands. Apply sparingly, and repeat application every few hours. Take for no more than 10 days in a row. A winter hardy perennial, comfrey is easy to grow. It does prefer rich, moist soil and full sun, and also tends to hog as much space as it can, so it's a good idea to contain it in a large pot buried in the ground. Growing to a height of about three feet, comfrey's large, hairy leaves can become heavy and tip the plant, especially after a rain. Its lavender to cream colored flowers and deep green foliage make it a nice backdrop for shorter herbs and colorful annuals. Note: Comfrey will often grow in areas where other, more demanding herbs, will not. So, even if it doesn't get the soil conditions it likes, there's a good chance comfrey will still succeed in your garden without much help. People typically have more trouble getting rid of comfrey than getting it to grow in the first place. Oh, and planting a little comfrey has more than just medicinal merit. Comfrey grows very quickly, producing an abundance of leaves. When turned back into the soil, those nice, fleshy leaves have nitrogen fixing properties and stores of potassium other plants will appreciate. This means comfrey will help reenergize your soil and encourage other plants to grow better. Note: A blog post is a snapshot in time intended for entertainment purposes only. Please research this and all herbal topics thoroughly, and consult with your doctor before trying any new herbal or other medical treatment. It was great to learn more about this permaculture all star... comfrey! Thank you for sharing. Comfrey tea makes a great liquid fertilizer for leafy plants and its so simple to do! Simply pick the leaves, chop them up and let them rot down till a stinky liquid comes out. Dilute that liquid 1:10 and give this to your plants. Check the BBCs Gardenersworld step-by-step tutorial: http://www.gardenersworld.com/how-to/projects/basics/how-to-make-a-comfrey-feed/200.html. If you're looking for a natural liquid fertilizer to boost plants where you want the energy to go to the flowers/fruit rather than the leaves then follow the process above but replace the comfrey with stinging nettles. I start my plants off on the comfrey and switch to nettle feed when buds start appearing. And its a great excuse to have these "weeds" in my garden for the bugs and beasties.